Necklace Length For Men: What's the Right Choice For You? Jewelry adds an element of style and personality to a man's wardrobe. Necklaces and pendants may be ways to celebrate, commemorate, or memorialize a person, event, or special relationship. Deciding how short or long the necklace should be will determine the overall impression your style leaves as well as how comfortable you are while wearing the jewelry. 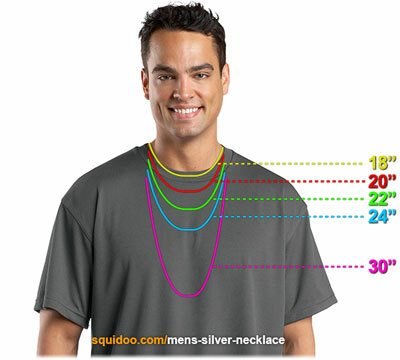 Our bodies come in all shapes and sizes, so the first step for a man purchasing a necklace is to measure his neck or collar size using a tape measure. The shortest length necklace that will fit around that man's neck is the measured length plus two inches. For example, if a man's neck is 17 inches, then a 19 inch necklace would be the smallest size expected to fit comfortably. This length would be considered a choker on most men. Depending on the circumference of a man's neck, this length necklace may fall an inch below a man's Adam's apple. For an adult man, this length may be too tight and uncomfortable. The most common length of necklace for men, the 20 inch chain will likely fall between the first and second button on a man's shirt or at the collarbone. This length necklace can be worn inside or outside a shirt. Another very common length for a man's necklace, it can work nicely a cross, dog tag, or other pendant is added to the chain. Usually falling a few inches below the collarbone, this necklace is usually worn outside a shirt. Usually falling in the middle of the sternum and worn outside a shirt, this length necklace also is fitting when a cross, dog tag, or other pendant is added to the chain. The longest of any standard length men's necklace, this length is designed to be worn outside the shirt without any kind of pendant.